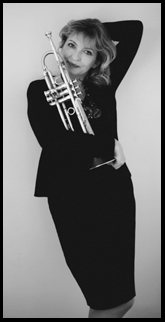 British Jazz Trumpeter - Fugelhornist - Vocalist - Composer Sue Richardson takes time to speak with Luxury Experience about her latest project, Too Cool - The Life and Music of Chet Baker, released to coincide with the 25th anniversary of his death, on the Splash Point Records label. The album is a stunning tribute to Chet Baker, who was the epitome of West Coast Cool. Sue, thank you for taking time to speak with Luxury Experience about your amazing release, Too Cool - The Life and Music of Chet Baker, which is without a doubt, your best release to date, it pushes you in new directions, and you soar. In a word, the release is stunning. It demonstrates your prowess as a vocalist, your fluid talent on trumpet and flugelhorn that flow seamlessly, as well as your exciting compositions and arrangements. Joining you on the release are Karen Sharp - baritone sax, Andy Drudy - guitars, George Trebar - double bass, Rod Youngs - drums, and Neal Richardson - piano and Rhodes, who also produced the album. This is your fourth release on the Splash Point Records label, and although you are a trumpetist and flugelhornist as was Chet Baker, how did come to select his music for the theme for your latest release? I did not start out as a Jazz singer, but I always loved him, although I never studied him or played his stuff as a musician, I just listened to him for pleasure. While I was in school, my music teacher gave me the Jazz album Getz/Gilberto, and that lead me to West Coast Cool, in particular to Chet Baker. For the 25th anniversary of his death, I wanted to dig deeper into his life and his music. You indeed accomplish that; in addition to the five Chet Baker compositions, Anticipated Blues, So Che Ti Perderò, Motivo Su Raggio Di Luna, Chetty's Lullaby, and Il Mio Domani, you also include the Rogers and Hart song, My Funny Valentine, and you wrote five of the songs on the release which capture the distinct West Coast Chet Baker sound, Too Cool, Adored, which you co-wrote with Annette Keen, All Through the Night, Almost in Ecstasy, and On A Moon Beam. What was inspiration for the selection and the creation of the songs? I have delved deeper for the first time into his life to look at the influences and his creativity. On this album I have explored his life in my compositions; incorporating elements of his improvisational style into my writing. I wrote the title track, Too Cool, which was inspired by a Chet Baker solo, and On A Moon Beam tells the story of Chet's death. Although he was not a composer, Chet wrote the songs, So Che Ti Perderò, Motivo Su Raggio Di Luna, and Il Mio Domani, while he was in an Italian prison. I translated the lyrics to all of these (with the help from singer Georgia Mancio). Do you have any upcoming performances scheduled to promote the release? I have several shows lined up. I am doing a Chet Baker tribute show, with special guest Karen Sharp at Ronnie Scott's in London on May 19, 2013, followed by shows at the Dereham Jazz Club on May 22, 2013, the Cambridge Modern Jazz Club on May 23, 2013, and the Denton Lounge in Worthing on July 15, 2013. I will spend this summer in the Cognac region of France where my parents live, and come back in September ready to go in the workroom and start again. I am not sure. Andy Drudy suggested that I do a release with really fast, loud trumpet with two electric guitars. This is the first time that I have no idea of what I will do next. I really pushed my writing with my previous release, Fanfare, which I followed up with this tribute album, so perhaps "fast and furious" may be next. I also became a university lecturer last year so that has been interesting. Sounds lovely. Sue, thank you again for taking time to speak with Luxury Experience about your latest release, Too Cool - The Life and Music of Chet Baker. The title, Too Cool describes it exactly, a fitting tribute to the musical genius of Chet Baker. 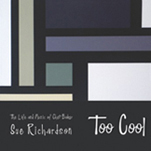 Websites where you can procure Sue Richardson: Too Cool - The Life and Music of Chet Baker are Splash Point Music, Amazon, Play, and iTunes.